Affirm or ignore. You get two choices in dealing with jealousy: affirm or ignore. When people are jealous, and you still want them in your life, listen to their concerns and affirm your loyalty to them. All they’re really doing is saying, “I’m afraid you’ll leave me.” Yes, it’s silly that they use anger or jealousy to communicate that – but you have to see through the emotions and meet them where they are. Alternatively, the other option is to simply ignore jealous people. Don’t bend down to their level or use their hurt or false concerns as an excuse to stop pursuing your goals. Revisit Your “Why”. If you’re not clear about why you want what you want, then you’re at risk of being derailed by the jealous people who are clawing at you, making negative comments or just side-swiping you with hate online. People get jealous when they see successful people. It’s part of the deal of getting ahead. But if you’re clear on your why you won’t stop when people jeer on the sidelines. Improve despite them. When people spew jealousy at you, excel even more. Get better not to spite them but despite them. Yes, people are jealous of short term success; but they also admire long-term success. So, keep at it, get better, develop excellence. 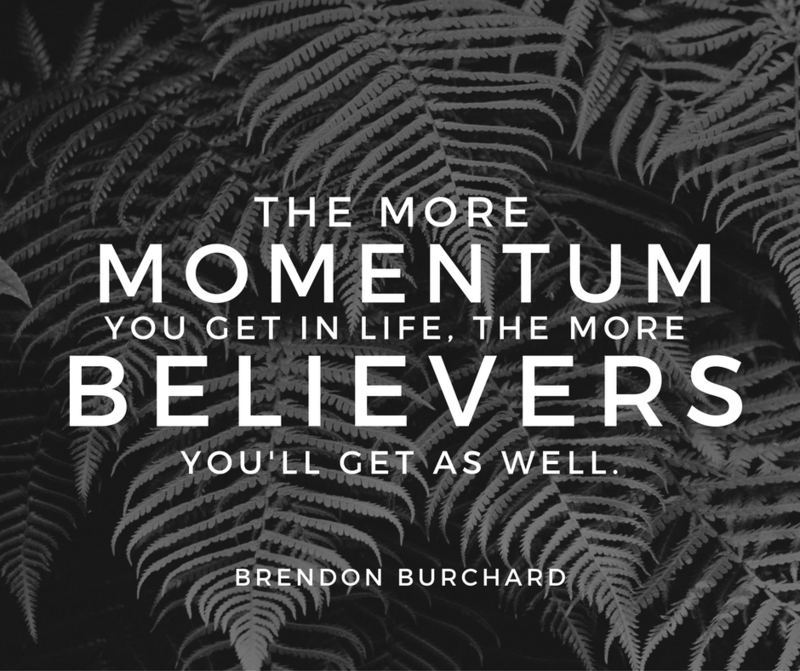 The more momentum you get in life, the more believers you’ll enlist along the way. Serve Others. People often send jealousy and negativity toward us because they are worried that we’re in it for ourselves – that we’re narcissistic in our striving and that they’ll get left behind. Usually, they just say mean things to check that you’re still human, that you still care. The best way to overcome their concerns is to continue reaching out and helping those on the same path of life who may be just a few yards behind you. Be the servant leader and the jealous clamor fades. Want more training? Join Brendon LIVE at High Performance Academy! How do you deal with jealous people? Usually, someone is either jealous of you because of your accomplishments, achievements, or efforts. Alternately, people are jealous because they don’t trust you. Maybe you’re in a relationship and you have this person who is jealous all the time because of their background, and they are always worrying that you’re going to cheat on them or do something awful. Or maybe somebody at work is jealous of you because you got the promotion. Either way, all of that is other people’s insecurities being tossed at you. So, how do you deal with that, stay sane and stay on your path? Let me give you four ideas. All you can do is be patient, kind, caring and continually loving through their jealousy. They have to figure out their own stuff. Unless you’re a therapist, coach or you’re equipped with dealing with that, you know how hard it is to get other people to change. If you need some advice on that, watch some of my other YouTube videos on the issue. It’s hard to change people, so all you can do is affirm them. Welcome their insecurities, vulnerabilities, and accept them where they’re at. Be kind and compassionate with them as they deal with their insecurities. The other option is to just ignore it. In 99% of the world’s jealousy, you should absolutely and completely ignore. When other people say, “Well, who do you think you are?” When other people say, “Well, it was easy for you.” When other people are jealous because you worked your tail off and you achieved things and now they’re trying to claw you back down to their level, don’t let them do it. Ignore the hate online. Ignore their stupid side comments. Ignore their passive aggression. You need to ignore those people, and not let it hook you. 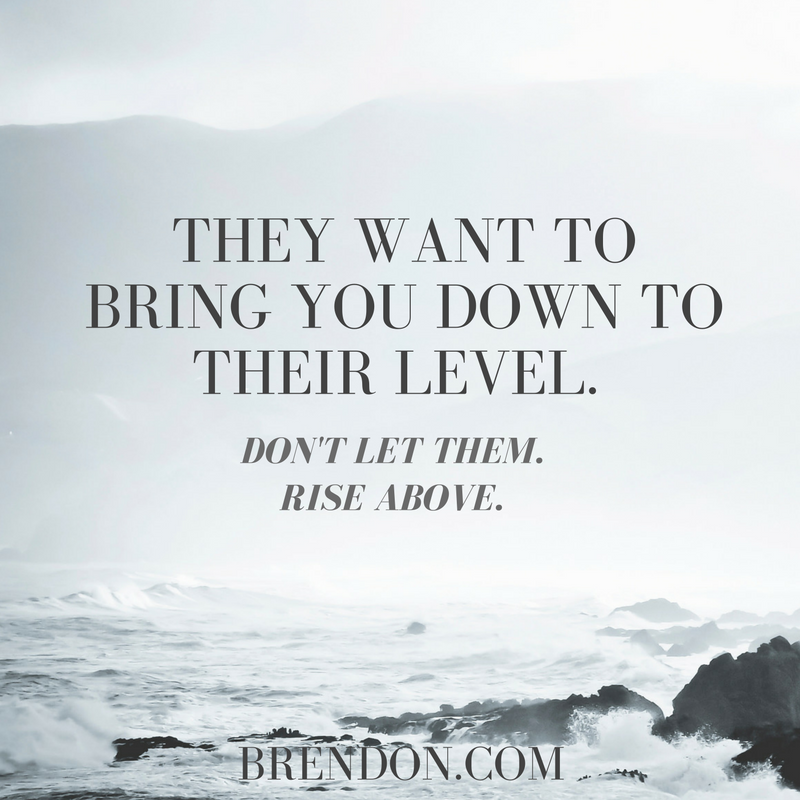 Don’t let it bring you down to their level, or ever let you stop being on your path. What is it you really want out of life, and why? If you’ve read my book The Motivation Manifesto, you know that our main search is to find the power to truly be ourselves and pursue the things that we really care about, that matter to us. It’s a pursuit to be ourselves fully, seek those things that enliven us and bring our passions alive. So, check that out. That’s what you need to continue doing. You have to revisit the reasons why you want to live your best life. The have you revisit the reasons why you want to achieve this thing. If you’re not clear about why you want what you want, then everybody else clawing at you, being jealous of you, saying negative comments or just kind of side-swiping you all the time, will derail you. You must be clear about your mission, your purpose, your drive, what you really want, your goals, and you must have that vision and don’t let anybody claw you back from that. Get better. Become even more excellent. 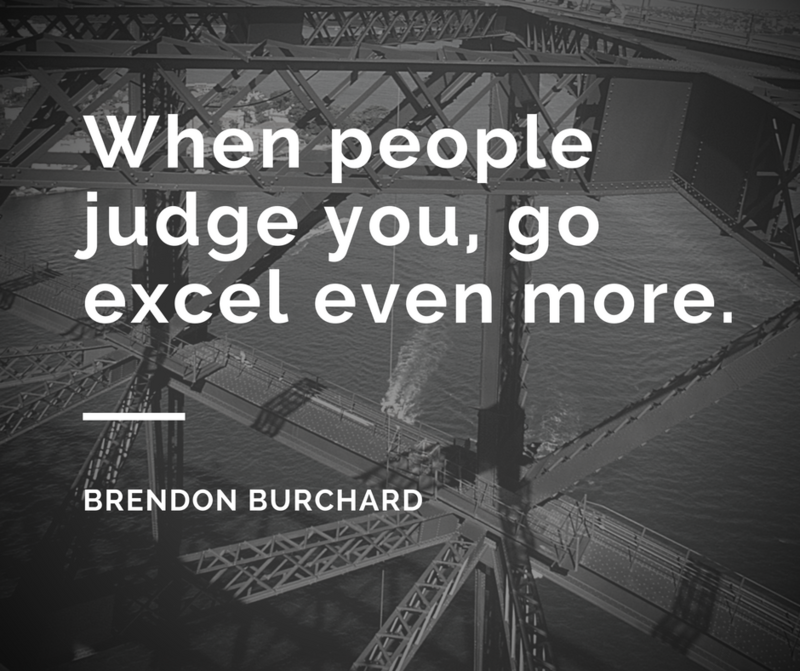 When people judge you, saying that you have it so easy, go excel even more. 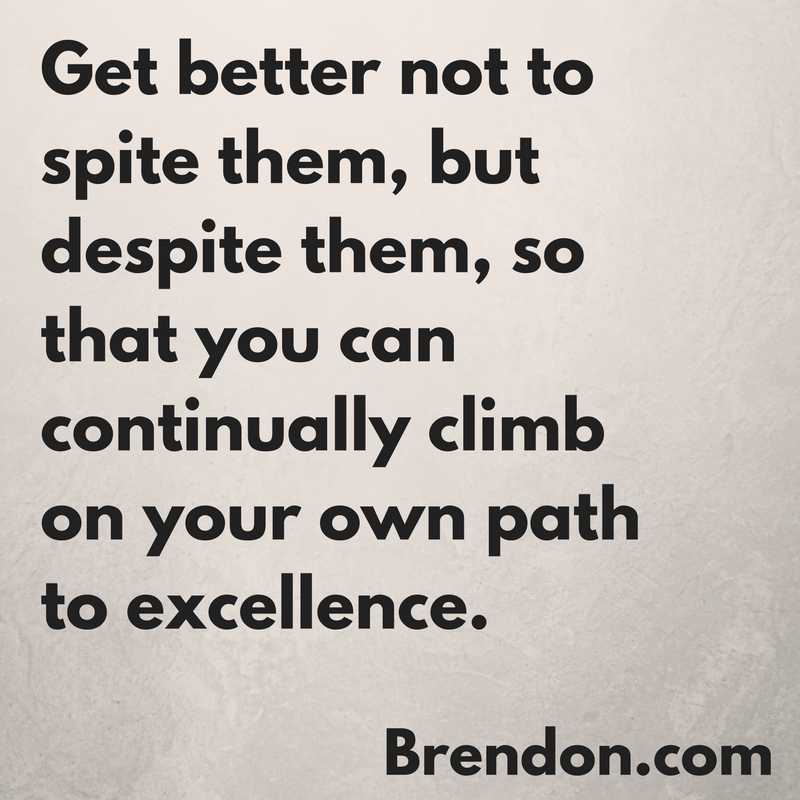 Get better not to spite them but despite them, so that you can continually climb on your own path to excellence. Maybe some people are jealous of you in the beginning, but then they start seeing that there is art to what you’re doing, that there is science to what you’re doing, that there’s hard work and effort. They’ll eventually see the actual situation, because ultimately, people are jealous of short term success. However, most people admire long term success. So, keep at it, get better, develop your level of excellence. The more momentum you get in life, the more believers you tend to get as well. They want to know that you’re still human, and the best way to demonstrate that is by reaching out and helping those on the same path of life who may be just a few yards behind you. Help lift them up. As Booker T. Washington taught us, there are two ways to exert strength. One way is by pushing down, and the other way is by pulling up. So, pull some people up. Help people. Offer a guiding hand. Give, donate, serve, and volunteer. Remain among people, serving and helping. Don’t become one of those people lost in your Hollywood Hills all by yourself, obsessing over yourself, staring at your belly button all day, thinking about how self important you are. Be that person who is still out there helping, guiding, serving, supporting, championing other people, because it’s hard to hate somebody who is a champion of others. So, you be the champion of others. Soon, those negative voices and jealous people will deal with their own stuff. If they don’t, ignore them, continuing improving, and remember your dream. If they don’t and they just need your love, then be there for them. Realize that you must stay on your path regardless of the jealousy of others. If you do that, not only will you shift some of those negative voices around you, but most importantly, you will continue living what we call, The Charged Life.